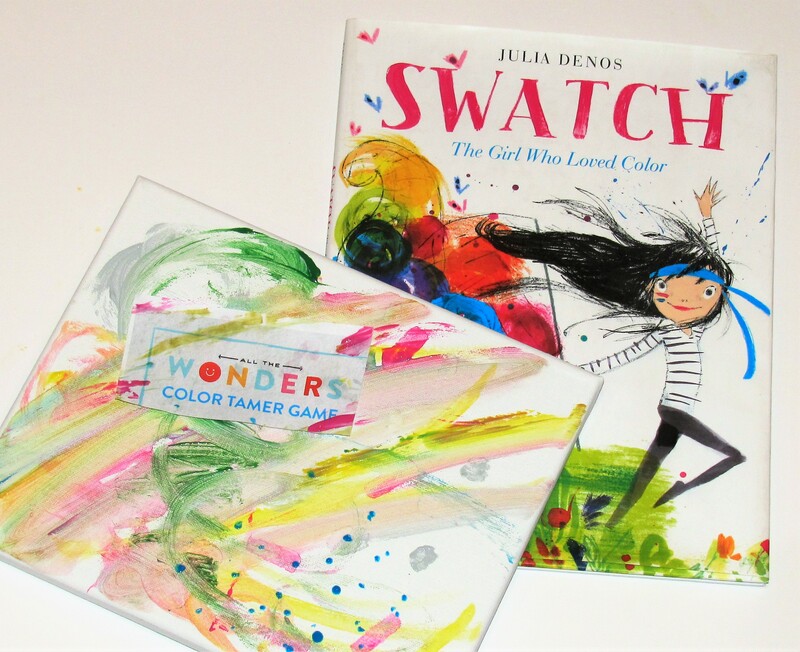 This week we feature all the wonders of author/illustrator Julia Denos’ new book, Swatch: The Girl Who Loved Color. You may have read books about color before, but you’ve never read anything like this! While we’ve seen many gorgeous books about colors in the past, none have added the extra layers of character and kinetics the way that Swatch does. In Denos’ capable hands, colors come to life – dancing, swirling, warbling, purring – for one color-taming girl named Swatch in a place where colors run wild. Denos’ book inspired us to create a hybrid – part game, part craft. 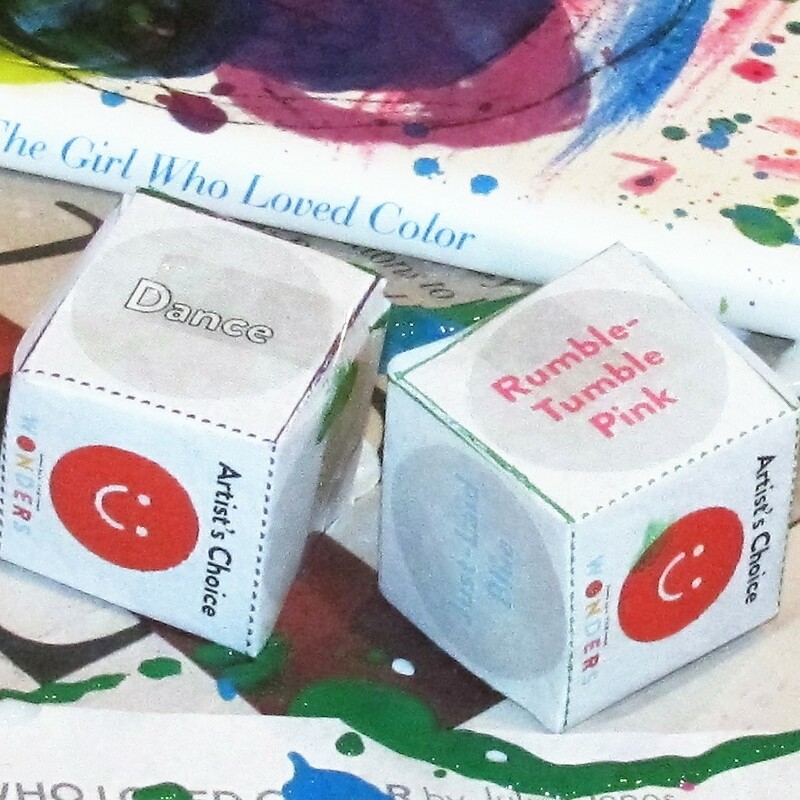 The activity hinges on two dice that feature color names and action verbs from the book. 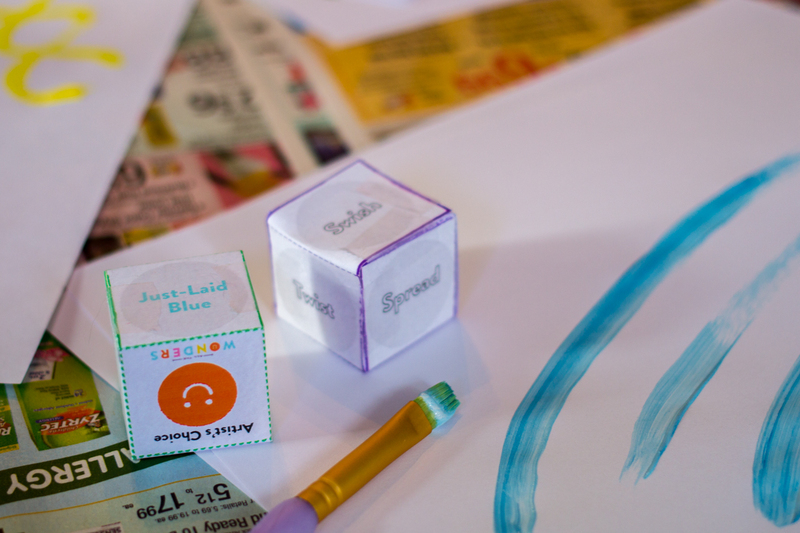 It’s quick and easy to set up, offers very open-ended play, and lets kids develop vocabulary and creativity while having some good messy fun. 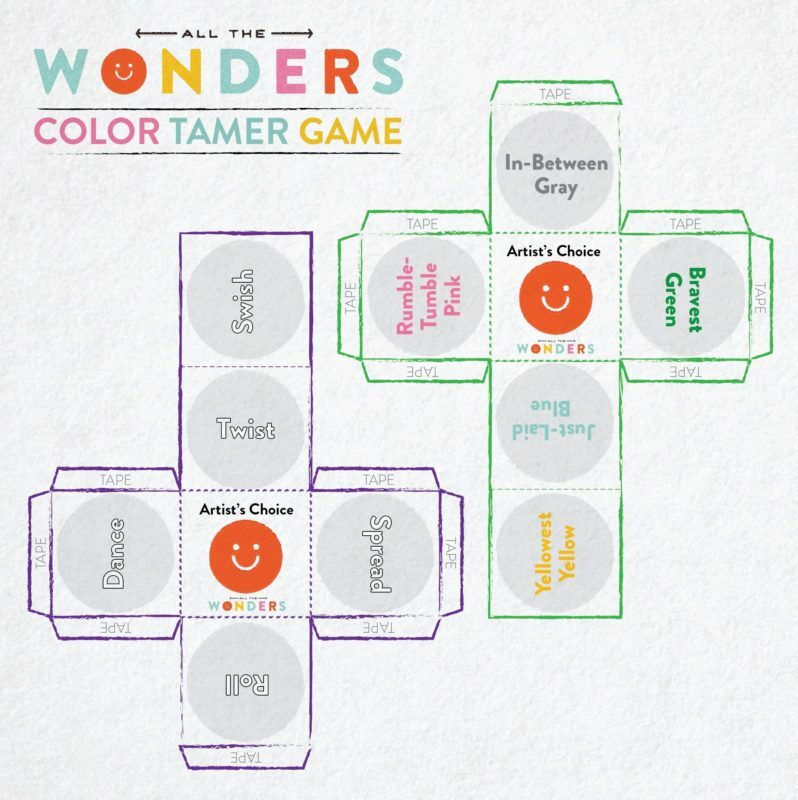 By the end, participants will become color tamers – just like Swatch – and can proudly announce this to the world with a custom Color Tamer badge. We’ve provided a printable sheet of badges (12 per page) or kids can design their own! Grab your art aprons and let’s get started! A variety of tools for applying paint – be creative! 1.Download the dice template pdf and print on heavy paper or card stock. 2. Cut out the dice and fold along dotted lines. 3. Fold tabs on solid lines and tape into place. 4. Set out your paper, paints, and painting tools. 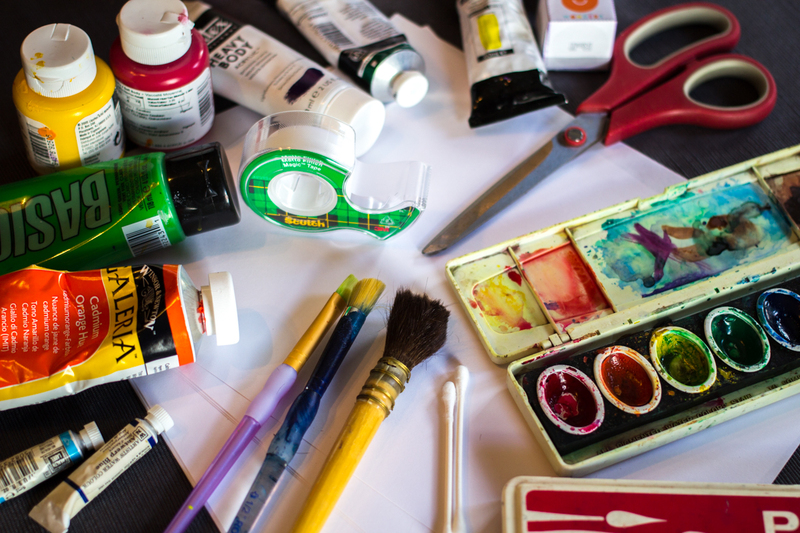 Be creative: in addition to paint brushes, try cotton swabs, toothbrushes, ping-pong balls, even fingers! 6. Paint using the color and action rolled. You can use any tool you like. “Artist’s Choice” is wild! *Large groups may choose to let each child take a turn rolling while everyone follows the cues given by the dice. Isn’t it amazing how many different works of art can be inspired by the same suggestions? At the end of the book, Swatch realizes that all the colors together make a masterpiece. Keep rolling and playing until you’re happy with your masterpiece. The best books not only entertain us; they teach us, and they change us. 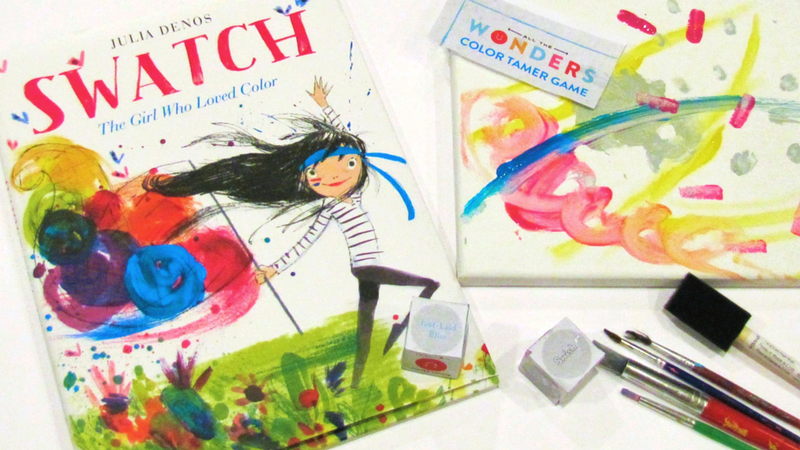 Through the reading of Swatch and the exploration of color and motion in this game, children change, too. They become color tamers! Hang your masterpiece in a place of pride, but also wear with pride the Badge of the Color Tamer. 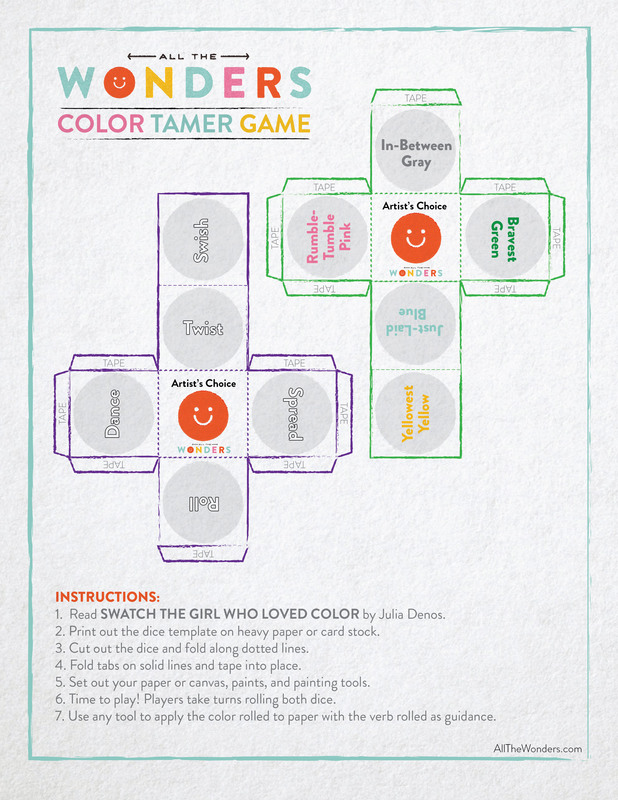 We can’t wait to see what you create with the Color Tamer Game. 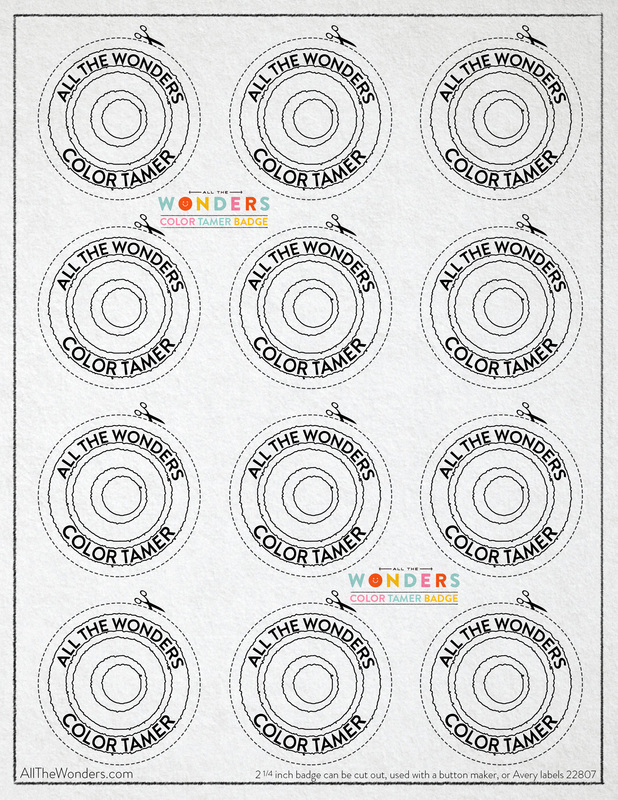 Post your pictures on Instagram with hashtags #allthewonders and #ATWSwatch. We’ll be highlighting your Swatch-inspired photos in special ways all week. 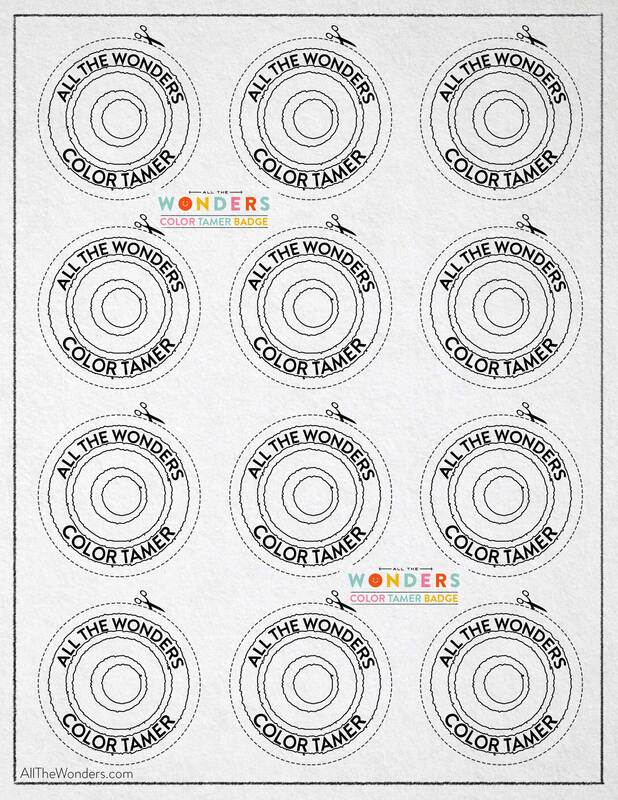 Don’t forget to follow @_allthewonders to keep up to date with the latest and greatest in children’s literature. Be sure to check out our ALL THE WONDERS of Swatch page for much more, including a look inside the book, a podcast interview with Julia Denos, a behind-the-scenes look at the creation of Swatch, coloring sheets, and a face paint guide.